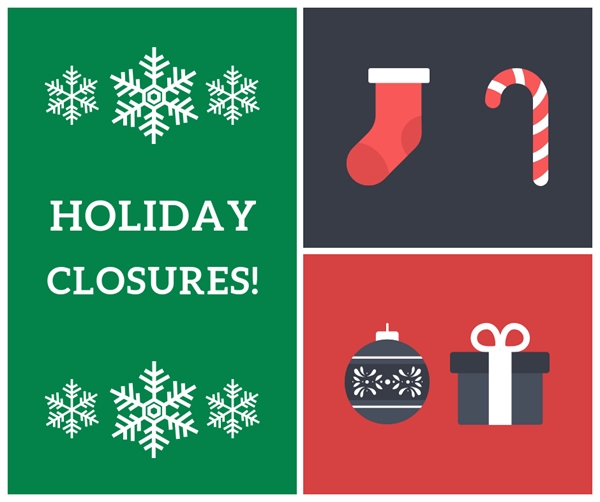 Williamson County offices will be closed for the Christmas holiday on December 24, 25, and 26, 2018, as well as on January 1, 2019 for the New Year’s holiday. The Commissioners Court will not meet December 25, 2018 and will have a short meeting with agenda items pertaining to elected officials’ offices and staff only on January 1, 2019. The Commissioners Court regular meetings are held on Tuesdays at 9:30 a.m. in the historic courthouse, 710 S. Main Street, Georgetown. The Williamson County Regional Animal Shelter, 1855 S.E. Inner Loop in Georgetown, will be open Christmas Eve from 11 a.m. to 4 p.m., closed on Christmas Day, and open regular hours on December 26, from noon to 6 p.m. The shelter will be open New Year’s Eve 11 a.m. to 4 p.m. and will be closed New Year’s Day except for lost dog or cat intake and reclaim. The Williamson County Landfill, 600 Landfill Road in Hutto, will accept Christmas trees for recycling December 26, 2018, through January 12, 2019, free of charge for Williamson County residents. Flocked trees are not accepted for recycling. The landfill will be closed on Christmas Day and New Year’s Day. Call (512) 759-8881 for more information.